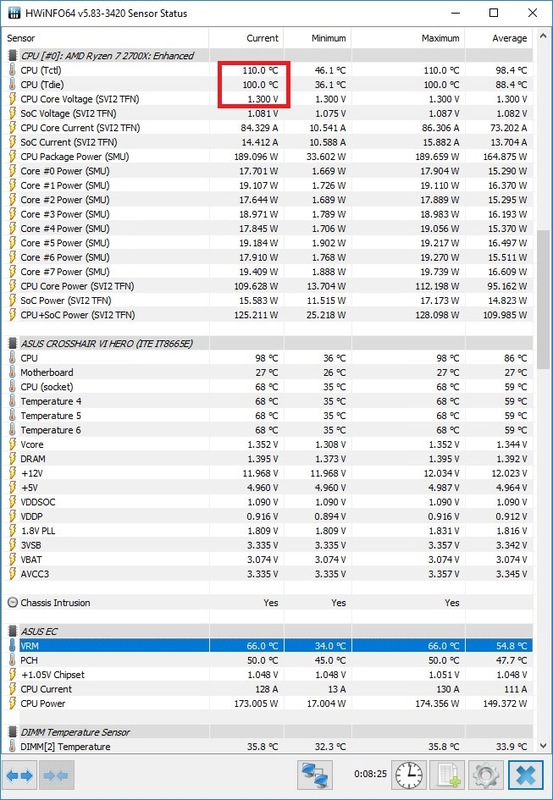 My 2700X is getting up to 115ºC Tctl and then shutdowns itself even at STOCK. Does Corsair LINK backup those readings? Under Prime95 stress and even the pump on quiet my slightly OCd 1800X barely hits 70. I come from a 1700 that OCed with 1.45V/LLC4 and never got it pass 85ºC. Now this 2700X with 1.25V/LLC3 goes up to 115ºC and shutdowns. BIOS updated to the one released two days ago? Of course, also tried other BIOSes. There was another person on here with an overheating problem, Does the Ryzen 7 2700X run HOT? which turned out to be a BIOS problem, and I'd say a reading of 140*C is either a sensor glitch or reading glitch which is throwing off the other readings, especially since Corsair has long since compensated for the offset temperature and matched the package and CPU temperature readings in their software, as well as AMD having corrected Ryzen Master's temperature readout. I don't care about what number it shows, I care about that number affecting my CPU so the system Shutdowns. Last BIOS, last everything and Ryzen Master shows also the same high temperatures. Everything in stock the CPU lowers its speed to 3700Mhz because of that and still reaches 90ºC or more. I think this CPU is broken. Found this post from Tom's Hardware Forum about the CPU watercooler you are using also causing the CPU to overheat. It is old but may still help you find your problem: Corsair watercooling H115i installation - cpu overheat - [Solved] - CPUs. I am getting a similar thermal shutdown when I set my cpu frequency above 3.8 GHZ on my 2700 X on my MSI X370 Titanium. Apparently in cinebench 15 and in Real Bench my cpu temps will rise to 100 Celcius and then shut down. I have excellent water cooling on my Alphacool Eisbaer 360 aio. I suspect AVX code i in Real Bench and possibly in cinebench 15 cpu (multicore) may be the point of soaring cpu temp. But on this same setup with my Ryzen 1800X on cinebench and Real bench my cpu vore temps never rose above 64 Celcius under full stress.. Is the cpu defective or is it the bios on the motherboard??? I am running the latest Pinnacle Ridge official bios on the Titanium. Same but all my CPU temps are high. Everything is the same I just swapped ny 1700 cpu for the 2700X. The CPU is COOL when I see 100ºC temps on my screen. I can just tocuh the socket and the back of the motherboard and it is cool. According to this Review on the Ryzen 2700X Temperature reading. It has an Offset of 10 degree Centigrade. AMD Ryzen 7 2700X review - Power Consumption. But I noticed on the image you Posted that the Tdie (correct temperature reading for the CPU) is 100 C which is overheating. What BIOS do you have installed? I am confused because there is no version 6101 for your Asus Motherboard unless you have a different Motherboard than the one I linked to. In the link concerning the Gigabyte Motherboard with overheating 2700X from my previous post, it turned out to be the BIOS causing the issue. I would try to flash to 6001 if needed. does a thermal shutdown at 100 Celcius under cinebench 15 or RealBench. or else the new bios does not work with the 2700X properly. Please can you download the latest version of Ryzen Master Tool and use that to check your temperatures? I just RMAed the chip. But thanks for your help. Ryzen Master was showing me the same high temperatures. If I set everything on Auto my CPU would just simply undervolt/underclock itself to 3.0-3.25Ghz and 0.9V under load to avoid Thermal Shutdown and keep under 95ºC. CPU was not meeting the requirements for 2700X spec (no even the 3.7Ghz Base spec is met) on BIOS default/Auto so I returned it. Overclocking, of course, was out of the question with these issues. I just popped in my old R7 1700 and it never goes above 45-50ºC while overclocked. AiO is fine, cooling is fine, PSU is fine... Everything looks fine except the CPU. Fair enough, hope the replacement processor fixes your issue. When you mentioned that when you touched the CPU and Motherboard around the CPU without burning your finger it did indicate a faulty sensor. 100 degree Centigrade is the same as boiling water temperature. Since the CPU sensor was giving wrong data to the CPU it was causing the CPU to act like it was being Overheated to the extreme causing the shutdown before being damaged. That is correct, sir. But I don't know what makes the System shutdown. Does the Motherboard do it? Does the CPU command it? Can i trick the temperature with the Temp Offset setting from the BIOS so I don't get the shutdowns? Maybe the BIOS does not know how to interpret the data or something. I am out of ideas. This link from Tom's Hardware explains the difference between Motherboard CPU temperature sensor and the CPU temperature sensor : An Understanding of Temperature on AMD CPUs and APUs - CPUs. The link is four years old but the info is still valid. I will bet my bottom dollar that your 2700X was not the culprit but the issue was the bios on your Crosshair VI. My issue which was almost identical to yours was resolved as soon as I installed the 2700X in the MSU X470 Gaming M7 motherboard., completely resolved. I have to believe the upgrade bioses they have issued for X370 motherboards are buggy and are at the heart of this issue. I don't have a X470 motherboard and X370 is supposed to support this CPU. quality is poor and in reality it often does NOT. Then, if the RMAed CPU turns to be ok. I will RMA the Motherboard. Fair enough. Meanwhile I would call Asus tech support and complain that the bios is not handling the the 2700Xthermals properly and see whatv they say about it. Have you received your new cpu yet? I changed a processor and still the same.AMD you do not say anything about it because it's for many people!Trotting.